Knowing how to safely heat your chick brooder is extremely important. Every year there is another news story about a barn or home burning down. Often it is due to a heat lamp falling or being set up improperly. It could be a life or death situation for your chicks, livestock, and even for your family. So let’s look at how to properly use a heat lamp and what other alternatives you may use to keep the chicks in your brooder warm. Chicks under a heat lamp with a red 250 watt bulb. Heat lamps are a popular choice for heating brooders because they aren’t very expensive and they put out a lot of warmth for your baby poultry. However, if you want to safely heat your chick brooder, there are some things you should know before you choose a heat lamp. Before you place an order or put eggs in an incubator, consider alternatives for using a heat lamp. If the chicks will be arriving during cold weather, can you keep them in the house? Or could you time your chick arrival so that you don’t need a heat lamp? If you can order or hatch chicks during mild weather, this is a great option. When the ambient (room) temperature in the barn is 50 degrees or warmer, you can use safer heat sources than heat lamps. This may not be possible, but if you’re raising just a few chicks it is easier to keep them in the house where the temperatures are warmer. Finally, if neither of these options will work for you and you really need to use a heat lamp, make sure that you do so as safely as possible. The Brinsea EcoGlow Brooder is a popular option for mimicking a mother hen. It has a heating element similar that provides warmth for chicks. The heating element is in a plastic housing with ‘legs.’ It may be raised or lowered to allow different sizes of baby poultry to nestle underneath. This is one of the safest ways to heat a chick brooder, as long as you don’t need as much heat output. 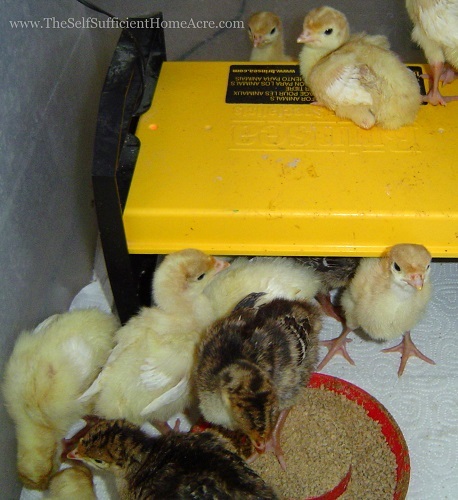 I’ve used the Brinsea EcoGlow Brooder and they worked well for keeping chicks in the house. They are fine when the room temperature is at least 50 degrees Fahrenheit. They are not designed for keeping chicks warm in a barn where the ambient temperature can be quite cold. You will need extra heat for those conditions. The Eco Glow Brooder didn’t last as well as I had hoped for. They were used in the house and moved to the brooder room in the barn to use along with a heat lamp. Two of these brooders died within 2 to 3 years of purchasing. I have not used the other similar brands so I can’t tell you if they hold up better. I’ve read online reviews from people who’ve had much better luck with their brooders. A seedling heat mat (germination mat) may be used to keep your chicks warm in the house. This is a less expensive option that provides heat similar to the EcoGlow Brooder. I used two seedling germination mats to create my Redneck Chick Brooder. That has worked very well as a replacement for the EcoGlow Brooder when keeping chicks in the house. It is not warm enough for using in the barn when the temperatures are cold. That set up has lasted for several years and my seedling heat mats are holding up well. They have the added advantage of being fairly water resistant in case your chicks spill their water dish. Tips for setting up your heat lamp. This is usually the least expensive option for supplying a lot of heat for your chicks. When using heat lamps, be sure that you follow all of the safety instructions on the labels. Use the proper lamp fixture and fasten the lamp securely to avoid causing a fire. Above, there is a video I created sharing some tips for proper setup and use of a heat lamp. I also discuss how much it costs to operate per day. In the video below I share tips for securing a heat lamp with several fail-safes to prevent it from falling. Please use caution when using heat lamps in your barn, home, or brooder. Before using an old heat lamp, give it a thorough safety check! Check the cord to make sure there is no damage. Make sure the hanging bracket is secure. Don’t use the heat lamp if the safety guard (shaped like an X and fits over the bulb) is missing. Make Sure You Safely Heat Your Chick Brooder! Heat lamps can, and do, cause fires. Follow the manufacturer’s instructions when using! In addition, the heat lamp bulbs don’t last very long. You can expect to replace them pretty much every year. If possible, raise chicks during warmer weather when safer options will keep them warm enough! Do you use another heat source for your brooder? Cheers for a great share!